Budster and I continue to enjoy the possibilities that Lego bricks can provide. Do you remember our Goodnight, Gorilla game with Lego blocks? Today I would like to share one of the first games we have played. 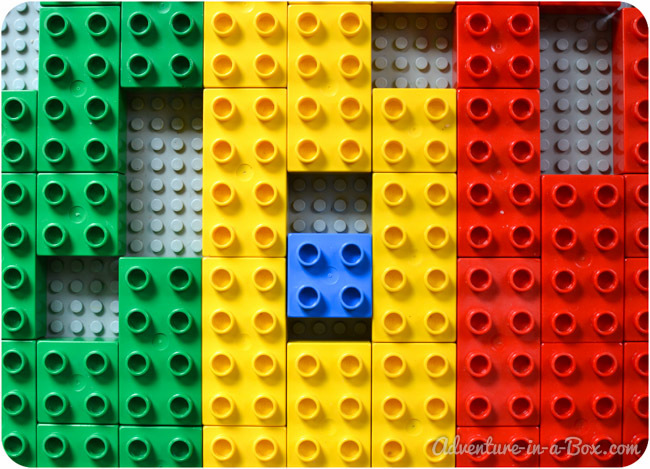 We got our bricks as an assorted lot of Duplo blocks on Ebay. I found it to be a great way of buying a lot of bricks for a starting set. However, there was no baseplate in our set. When Budster learnt to connect to blocks together and wanted to keep working on a tower, I remembered seeing a baseplate in our basement. It was left since Daddy’s teenage years and intended for the standard-sized Lego bricks. I recalled reading that Duplo and standard blocks are supposed to connect together and rushed to check this theory. It worked! It was however, a little hard to attach the blocks directly to the baseplate, and I decided to create a layer of Duplo over the plate, so that my son could make his creations on top of it. Budster immediately came to help. 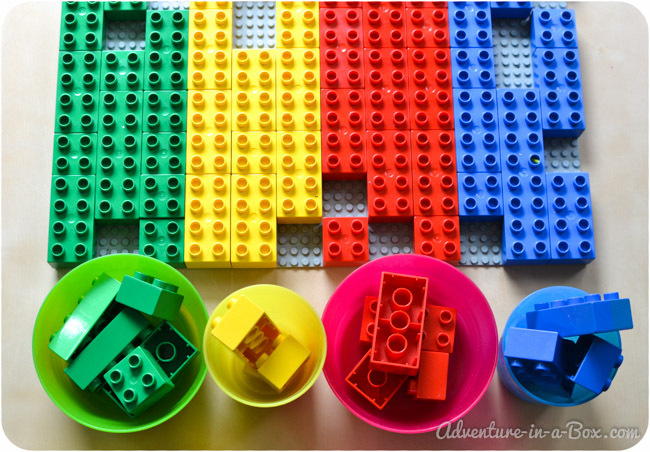 He liked filling the holes with random bricks, and that’s when the idea of making it into a colour- and shape sorting game occurred to me. On the 12 x 12″ baseplate, we built twelve rows in four primary colours. Green, yellow, red, blue. Then I took some bricks out, and we sorted them in the coloured bowls. At this point Budster could hardly wait to start putting the bricks back onto the plate. He grabbed one bowl and went to work. Budster matched most of the colours well, but sometimes he insisted on inserting a differently coloured block. I had no objections if it suited his aesthetic preferences. 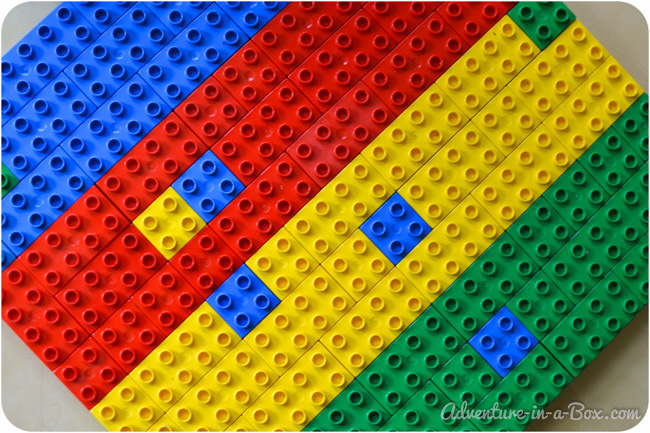 A blue block against the yellow row – who knows, maybe my son was secretly studying the complimentary colours theory! 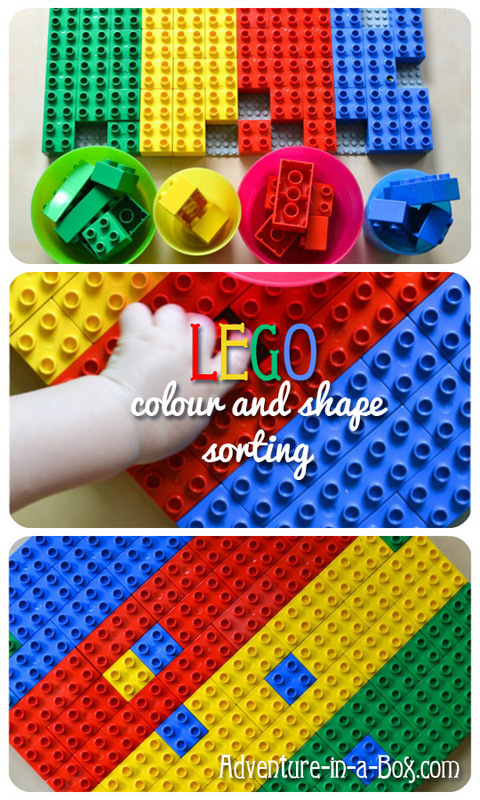 If a toddler does not want to match colours, it is still a fun game and a good exercise. He can work on matching shapes and decide what size of block he needs to fill a certain hole. 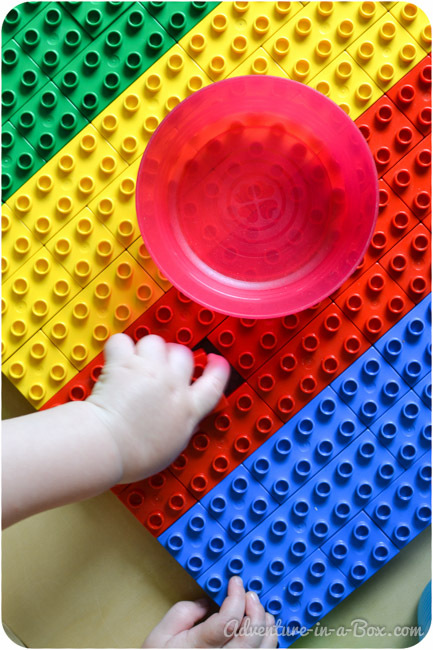 Simply playing with bumpy Lego bricks is a great sensory experience, and putting them together develops fine motor skills. That’s what we got in the end. …And then we built a house, and the row of blue was water, the green blocks were grass, while the red and yellow ones were clay and sandy soil. What have your children built of Lego recently? We would be happy to see pictures of their creations on our Facebook page. If you want to stay updated on other stories from Adventure in a Box, consider subscribing to our Pinterest or Instagram pages.Thank you for reading! More fun Lego projects can be found on the board below. Follow Liska – Adventure in a Box’s board Lego Fun on Pinterest. 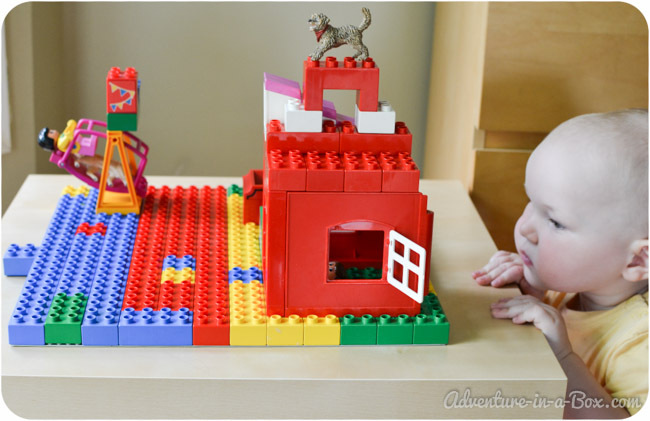 I love the idea of placing Legos and having children pull them apart (which is super fun!) and sort colors. Love it!